What happened on 11 September 2001? On 11 September 2001 (known as 9/11 in America), Islamist extremists hijacked four planes that were flying above the US. Two of them were flown into the twin towers of the World Trade Center in New York. Another was crashed into the Pentagon, the top military building in the capital city, Washington DC. The fourth plane crashed into a field, 80 miles from Pittsburgh, Pennsylvania. The attacks shocked the world. It was the biggest terrorist attack ever on America. 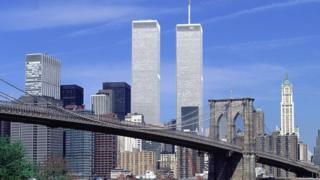 The twin towers of the World Trade Center were the highest buildings in New York, and famous throughout the world. Their destruction transformed the city's skyline and would have a huge impact on the rest of the world for years to come. US air traffic controllers confirmed a passenger plane, American Airlines Flight 11, had been hijacked. Flight 11 crashed into the north tower of the World Trade Center in New York. 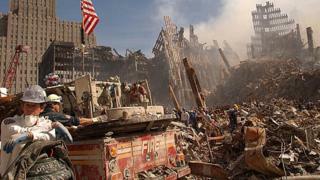 A second hijacked passenger plane, United Airlines Flight 175, crashed into the south tower of the World Trade Center. 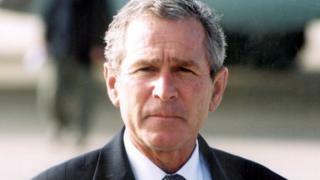 The then president, George W Bush, promised Americans they would "hunt down and find those folks who committed this act"
US President George Bush made a TV statement to people in the US, saying: "We have had a national tragedy. Two aeroplanes have crashed into the World Trade Center in an apparent terrorist attack on our country." A third hijacked plane, American Airlines Flight 77, crashed into the US military headquarters in Washington DC. The south tower of the World Trade Center collapsed to the ground in New York. Many people were killed, including emergency workers and firefighters who went into the building to help people. A fourth hijacked plane, United Airlines Flight 93, crashed into a field. The north tower of the World Trade Center collapsed to the ground as well. Many more people lost their lives. How many people were killed on 9/11?